Jennifer talks about one of the first quilt that she made, taught by her American mother-in-law, which she describes as traditional with a contemporary country twist. It represents a turning point in her life, following the death of her father she wanted to change career. She talks about learning quilting, finding her unique selling point (especially her interest in quilt history and traditional blocks) and developing her craft into a business. Linda Seward [LS]: It’s the 9th January 2015. My name is Linda Seward and I’m here interviewing Jennifer Campbell Kirk. We are at 230 Tower Gardens Road in London and the ID number is 2014.046. So, Jennifer, you’ve got a lovely quilt here that you want to talk about. Can you tell me about it? Jennifer Campbell Kirk [JCK]: Yes, this is a traditional quilt block called Expanding Star, and my mother in law introduced me to this. And it was one of my first quilts that I made back in, I’d say the summer of 2012 and not long after I came back from Dallas, Texas where I spent a whole month learning patchwork and quilting with my mother-in-law, which was absolutely fantastic. It was one of the best months of my life. And, I think this quilt for me is really special, and it’s special because I think it was what I was really trying to achieve or what drew me to traditional patchwork and quilting is the traditional blocks and their history and the story behind in that it evolves from Evening Star and that really dates back to the late 1700’s, so I really love the history about it. But how I’ve done it in terms of using gingham, it’s got a real country English feel to it. And I love this kind of fabric from Minick and Simpson. So I love the combination of doing something very traditional but have a bit of a contemporary country feel and that was really what I was trying to do was kind of merge the two together and have a traditional block that felt very fresh, very contemporary, and very vibrant yet at the same time has this depth of history behind it. LS: So tell me about the colours you chose. JCK: Well I chose, it started off with this gorgeous floral fabric here, this kind of tourquoisey-blue fabric which has got kind of like a, feels like a 1950s kind of a colour for me. And with the beautiful red rose. I really love that combination of the blue and the red, it’s got as I said that really kind of vintagey feel to it. And then I knew that the gingham would kind of take it somewhere else – it would make it quite countrified. So that was my thinking behind it, but I wanted lots of cream, lots of kind of light colours, to balance that, to give it a fresh, modern feel. One of the things that I noticed with the quilts that, you know, my mother-in-law had, and the books that she had, and the kind of traditional kind of quilts is that it was very fussy. There was lots going on. Lots of different colours. Lots of different patterns sitting side by side and it wasn’t me. And so I wanted to find a way of bringing something traditional but really simplifying it and making it breathe. And I think that’s what the cream does. It creates that space for the fabric to sing almost and that’s was my inspiration behind it. 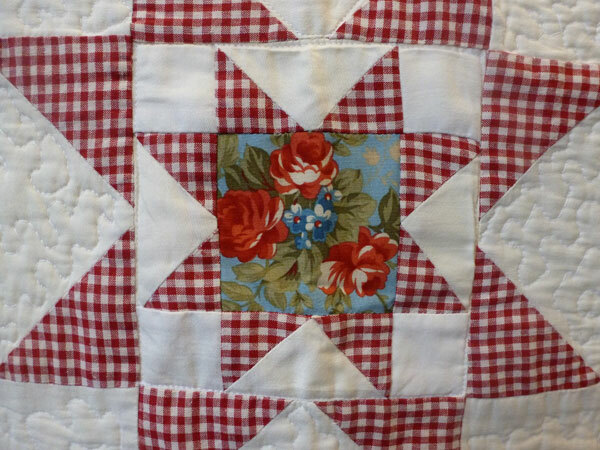 JCK: So the quilting again is really special for me because when I came back I mean the kind of quilting I was taught as a beginner was ‘stitch in the ditch’, which really helped me kind of understand about quilting, and a really good introduction. And then I started seeing lots of quilts with this kind of amazing kind of jigsawy, free-motiony kind of design and so I came back and I did some classes, and the very first class that I did I was so frustrated, because I just thought I am never going to get this, it was just so hard to do! And I kind of left it for a few months and then I did another class, and the lady was so encouraging, and I just said to her,’ well I’m not sure if I should do another class, you know I was ‘it’s not, I can’t get it’ [laughs]. And she says ‘Jennifer, it is just practice’ and yeah she really soothed me [laughs] and encouraged me to come and try it again, which I did and it was really strange because I was, I did really well in that class. And I don’t know, maybe it was because I just felt like ‘yeah, you can do it, you just need to practice’, and I wasn’t tense or stressed about it or anxious about it. And you know, everyone was saying ‘Ah, you’ve been practicing’ and I said ‘look, no I haven’t’ [laughs]. And then after that class I just flew, and I thought, ‘do you know what, I’m going to take a risk and I’m going to try it on a quilt’. It’s all right to do it on a sample piece of fabric or you know a sample sandwich, but to actually take the risk and put it on put it on a quilt, well I thought the worst thing is, I can just undo it. And so I did with this, and I’m really proud of it. I’ve evolved [laughs] in terms of my growth and my skill, but for me it says so much about perseverance as well. LS: So how do you use this quilt? Do you sleep under it, do you cuddle up with it or is it just for show? JCK: It is just for show. I do, I tend to bring this along when I have fairs and things like that and retail shows. People do gravitate towards it, I think because it is so vibrant and it has that kind of traditional feel, but it looks really fresh, so people do tend to gravitate towards it, so I tend to use if for that. It’s a little small, I guess it’s kind of like a child size quilt, but I find that it’s really helpful, if I am thinking out ideas, to use this size of a quilt. It’s big enough to get a real sense of what it might look like in a, as a big quilt, but not too big a task is terms of getting it completed and getting it done, so, yeah, I tend to use it like that and you know it hangs in my sewing room and I think of it fondly [laughs]. LS: So you were saying that you were taught to quilt by your mother-in-law. So tell me more about that. JCK: So the end of September 2011, my father passed away and mother-in-law happened to be in the country at the time. I think she came like two or three days before he died. And he died in another country, he died in Jamaica. And it was very difficult for me because I was planning to go and see him, and my siblings and relatives had seen him in August and in July and in the summer and they said you need to hurry up and go, you know he’s not going to last. He was very sick when he left here and I think he’d left here like maybe three, four months before he died. But in some ways I was so glad that he died where he wanted to die. He didn’t want to die in this country. But I really wanted to get there. And my mother had died three years before, very suddenly of a heart attack, like a week after her birthday, So it was really much for me in the sense that my sense of history, which you know, one’s parent do carry, was just gone, it felt like having a rug pulled underneath me. So having my mother-in-law here was a real blessing. You know she was so patient with me, because she was here as my guest, and you know, I had taken time off work anyway, just to be here with her. She was going to be here for two and a half weeks. And so you know I was, it was just a gift to have her here because she was really patient, and she represented I guess that motherly, parenting kind of figure that was very much absent for me. And you know, she just said I was very depressed, I just didn’t want to do anything, as one can imagine. I think the shock of it as well, that I had been through it a second time. And she just said ‘would you like me to teach you how to make an American quilt?’ and I said ‘okay’, because I didn’t want to do anything else. And so we went and bought fabric, and she just sat down and began to teach me, actually on this machine, an old, a really old Brother machine that I had. And actually, I sat right here and that’s where I sewed. And it was so therapeutic. I think it overwhelmed me how therapeutic it was because it was doing something that one had to be mindful of, yet at the same time one could be quite mindless about it. One could just get lost in it and just think about one’s thoughts. Yet at the same time, every now and again you had to refocus, because you want to make sure that that stitch is right, you know, you want to see what you’re doing and know what you’re doing. But it, and I think also, as well sewing by machine, oftentimes people talk about sewing by hand, I wasn’t sewing by hand back then. But the actual, the noise of the machine, believe it or not, had a very soothing effect on me. And I loved it. I became so hooked on it. And when she left I was still practicing. But back them I was just doing whole-cloths. I wasn’t doing any cutting and anything like that, and piecing, any patchwork. It really was. She really just taught me the simple way of just getting fabric and, actually even then I wasn’t even making a quilt sandwich, actually it was all made for me. It was fabric and some kind of synthetic wadding, and then all I had to do was put the fabric on top so it was very easy. But it was very soothing. And after a while I became a little bit frustrated, ‘cos I knew there was more and so what I did was after I had my bereavement leave, I think I took about two months off work. I went back to work and I was different. I wasn’t the same, and I knew that actually this is not the job that I want to do and I always wanted a job that I could do at home. And I always wanted a job I could do with my hands. But I wasn’t that way inclined, I wasn’t that, creative in that way. I was more creative in terms of drama that was what I studied at Uni. And it terms of singing. That was more of my creative outlet. But I always wanted to do something with my hands. And this gave me the satisfaction that I was doing something with my hands. So I arranged with work to take a month off, and actually, when I came back I was facing redundancy anyway, there were lots of cuts, I worked for a local authority. So actually the timing was good and there was another opportunity at work and so I thought right, what I will do then is take a month off between both jobs and then when I come back I’ll start the new one. So that’s what I did. I took a whole month off, flew to Dallas, Texas and just spent that time with my mother-in-law and it was heaven. It really was, because, you know I was still bereaved and I just had time. And she’s, and it’s interesting, I know it sounds quite strange but I can see why my husband married me, because we are very similar. We really are [laughs]. So she’s quite stubborn in some ways and so am I. But we worked really great as a team. And you know, we were away going fabric shopping, and we’re really bouncing off each other, and it really was a wonderful experience. And I got to know her as well. Because prior to that she had come here for a couple of weeks and you know, and I’d take her out and that kind of thing. But to come to her home and spend that month in her home and yeah, it was a real kind of bonding opportunity for us, and we really got to know each other, which was really lovely. And you know I would spend eight to nine hours a day sewing. I was hooked. And it’s interesting, I reflect back now on what would take me twenty minutes took me a good two, three hours. You know, just really trying to arrange those blocks and you know she’s quite old school in the sense that, you know, everything has to match up in traditional quilters, very much like that, isn’t it? It’s very much about matching seams and the aesthetic of it in that kind of sense. So I, you know I, I was persistent [laughs]. There were times when I thought, a bit like when I came back and tried to do ‘free-motion’ ‘I’m not going to get this… I’m not going to get this. I’m not going to get this…’ and I was just persevering, and she was so encouraging and I think another reason why I believe I was taught so well is because she used to be a headmistress and so she was so good at teaching me in terms of what to do next, in terms of encouragement. She was just so good, and I think that was so important for me to have that because I’d done nothing like this before. You know, sometimes people have done dressmaking, or knitting, or some kind of craft with their hands and it was so new to me. I really felt like I was starting from absolute scratch. And, but I loved it. I loved it, I loved it. You know, often times she would leave me in this lovely sewing room that she had, it was huge. And she had fabric, oh my god did she have fabric! And she was so generous with it. Anything I wanted to use, you know she would allow me to use it. She say ‘hey, why don’t you take it home with you’ and she was. You know people talk about you know, quilting is about the fabric. And there is something wonderful about choosing fabric. And I got that from her, and I understood that from her quite early on, in terms of going to these amazing fabric stores in the States and she would drive me everywhere! And the selection! I really began to appreciate fabric, and have a real respect for fabric. Just going to these different stores and just seeing the colours. And I’ve always been good you know, always been good with colours. And I mean when I was a teenager I worked for a ladies department store, and quite quickly I became the kind of the main person that did the casual kind of dressing. So I was, you know I was very good at putting fabrics together and matching and so all of that came back. And you know my mother-in-law would, it’s interesting because you know she would ask me questions, she said ‘oh do you think this goes with this?’ So she really began to identify and said actually ‘you know, you are better than me. You know you’re better than me in terms of putting fabrics together’ and it was a real honour for her to say that, such a seasoned quilter, to say that to me and it was really encouraging. Yeah, it was a really special time and I’m so glad. That was my introduction to patchwork. LS: So you came back to the UK after this month. What happened? How did your quilting develop after that? JCK: So I started to do a lot more kind of patchwork. And I guess this quilt here kind of like represents that period of time where I was really hunting around for traditional blocks. That’s what it gave me a real hunger to find out more about these amazing blocks. And she would. One thing to say is that she had a lovely quilt on her bed. And it was a sampler quilt. All these different blocks and I loved it. It was so lovely. And she said ‘oh, I’ll give it to you.’ And I said ’Oh No! I can’t. It’s too nice.’ And so what she did was, she… what happened with this quilt was that a friend of hers had pieced it together and had asked her to quilt it, and then once she’d done that her friend said ‘Oh just keep it.’ So that was the story behind it, which was another reason why I didn’t want to take it from her. So she spent the time with me working out the patterns. Because I said, oh I love this quilt, I would love to make my own. And that was what we did. So, like, every day I would do a different block. 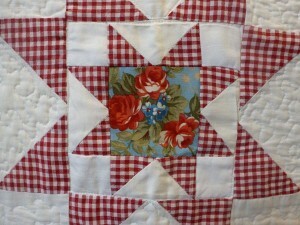 And that was a great introduction, as I said, in terms of the different kinds of quilt blocks, the traditional blocks. So what she would do was she would sit down and she would work it out. But she wouldn’t just work it out. She would tell me how she was working it out. And that, for me, even now in my own practice, is gold. Anything I can see, I can sit there and I can work it out and I can make it. So, you know, she taught me so much. And so actually, when I was coming back, as you asked, that’s what I was doing. I was hunting around for quilt blocks and looking at all these wonderful encyclopaedias. Going on Amazon, collecting them. I became a bit addictive in buying all these traditional blocks, hunting around for them. And if I came across a block that didn’t have a name, I would do my best to try to find out ‘what is the name?’ Because that for me is really important. I remember people saying to me ‘what’s so important about the name?’ I’d say, well that’s the history, that’s the story behind it. That’s the depth of this block that I really want to research and find out about. So that’s what I was doing. So I was buying lots of books, and I’d find a really old-fashioned book, which didn’t have the kind of instructions of how to use a rotary cutter in terms of creating them, often times, in terms of patterns. And so I’d look at this and I’d think ‘well actually I don’t want to use a pattern. I’m sure I would be able to just work it out and cut it in such a way that I would be able to cut it on a rotary cutter’. In fact, that makes sense. As opposed to just drawing around, you know, a pattern if that makes sense. So that’s what I was doing. A lot of these books were printed in the 1960’s or whatever and so I would sit there and I would work out how to do it and practise and try and do it so it was a real time of discovery for me. And even now I still look for quilt patterns, you know. I’ve got a book that has got about 5,000 in it, and I know there is more [laughs]. There’s always more [laughs]. Because I’m always coming across a quilt pattern and looking in my book and ‘oh, it’s not in here’ and so that makes me curious. And I think that’s what patchwork and quilting does for me, it feeds my curiosity. And I want to know more about these blocks and I want to know about the history and I want to communicate it to others, so that’s what I tend to do is, on my website, I will tell the story about this particular block, and hopefully other people have the same kind of passion as I do about it. LS: Okay. So when you came back it was still a hobby, but it has turned into something else for you, hasn’t it? LS: So tell me how you developed the business, then. JCK: So when I came back, everything started to fit together which was wonderful. So, I don’t know how a came across it, there were lots of government websites about business start-ups and that kind of thing, and I… Ah, just before, just to just go back a little bit, when I was offered this other job at work, it was offered to me as a permanent job and I said I don’t want it as a permanent job. I will only take it if it is a secondment, and I will only take it if it is a secondment for 18 months. Because I thought, great, that will give me 18 months to try and set up my business. So that’s what I had. So when I came back, I knew I had 18 months to try and get this off the ground and make it work. So I started doing some research on business start-up websites, there’s government websites, and I don’t know how it happens to one, when you are surfing you come across so many amazing things. I came across this workshop, it was, was it a workshop? It was like a course. It was like three days, and it was with Doug Richard who is, who was on Dragon’s Den. He was one of the original Dragons where people go and pitch their business ideas in front of these millionaires and they give them backing or not. And he was one of the original Dragons. He’s from California. And so he was running this three day course, business course for Creatives. And he was in partnership with Country Homes and Interiors magazine. And what it was, it was for people who had business, creative ideas, craft ideas, and almost like what they call like that ‘cottage industry’. You know, it was aimed at people who started on their kitchen table and that was me, that was so me. Everything I was reading I thought ‘oh my god this is me, this is me, this is me’. And that’s what I did, I started here on my kitchen table. So I, the course was like, I think it was like £400-500. And so I sent them an email and I said ‘Oh my god, I have just come across this course that you are running for three days, but I can’t afford £400. Do you have some kind of bursary or something like that?’ You know, if you don’t ask you don’t get. And they said ‘Yeah, yeah [laughs] we can offer it to you for £120 how is that?’ And I said ‘Perfect, I’ll take it. Because I knew, it was just outside London, so I knew I would need money for a hotel and travel and everything, so I was totalling that up. And so I stayed, actually stayed, it was in the Hilton hotel, the same hotel, I thought I’m going to stay right where they are! And so I was on this course, and that, I guess was a real turning point for me in terms of making it into a business, or beginning to think about ‘can I really make this into a business?’ And you know a couple of people had said ‘well you can’t really’, you know. And actually even on the course, it was interesting, there was a lady who was sitting on my table, and she said ‘well I started off doing patchwork, you know making quilts and things, and I couldn’t make a living out of it.’ And she said ‘possibly you’ll sell to grandmothers who will buy for their grandchildren, but you can’t really make a living out of it.’ But I thought ‘I think I can, I think I can!’ I really, I really believed I could. And the good thing about being on that course was that I think Doug Richard believed in me. And he was the kind of person who, you know he is such an interesting character, and I really grew to really like him. And we ended up having a really interesting friendship, actually. Because, you know, he is very honest. Very, very honest. And the kind of response he was giving me, if he’d, I felt like if I couldn’t really make a business out of it, he probably would have told me in some way, or asked me those kind of questions to make me think about whether or not I could. That he. The kind of questions he was asking was more about ‘Well, what makes you different?’ and ‘what is your USP?’ kind of thing. And it was mind exploding. The kind of questions he was asking me really made me think that it was about branding and it was about, you know, how I could communicate that message to other people to encourage them to buy. LS: Can you just tell me, what is a USP? JCK: Oh, Unique Selling Point. Yeah, so what made me different than other companies. Because, on the high street, quilts were being sold but they were made in India or they were made in China. And often times they weren’t patchwork, they were wholecloth quilts, because they are quick and easy to do. And so, you know, the kind of questions he was asking me were really about Jennifer, going and doing your research. I remember having this notebook and writing so much and what was interesting is that the editor of Country Homes and Interiors Magazine was in the room because they were sponsoring it. And I’m quite talkative as you’ve probably gathered [laughs] and initially I think people were quite quiet, and he says ‘well okay, you seem to be the one talking, okay’. You know so he gave me some time. He gave me a good ten minutes about asking me these really pertinent questions about my business and how I could make it into a business, and really started making me think and giving me that opportunity to tell my story. And quite quickly it became apparent that, wow, what is so different about you is your story, is how you got into making patchwork. And for me, you know people way ‘wow, you’ve got a great story.’ But for me it’s my life. It’s not a, you know it’s a lived experience and it was a journey that got me here. And actually, as I said, the editor was there and really listening, you know when I was talking about my passion, about the traditional quilt blocks and the stories behind it, and how the, for me it became, was becoming my reference point, because my sense of history has evaporated and this is has given me that history back, and that connection with the past. So they really got it, and understood that so. In the break, the editor came up to me, I was really surprised! And she said ‘I really loved what you said, and I would really love to find out more.’ And so she gave me her business card and it kind of started from there. So anyway, at the end of that course you know my head was buzzing, I was so excited, so motivated. And a little bit more clearer about what I wanted to do. And he was saying, ‘well if you really enjoyed this three day course, we’ve got a year-long course.’ And I thought, ‘Great, that’s what I am going to do’. I’m going to apply for it. And he said, ‘places are really competitive. For every person that applies, we turn one person away. We have about a 100 places. You know it’s very oversubscribed.’ And so I remember going up to one of the programme managers of the course and he, you know, people gravitate towards me, and having that opportunity to really talk about my story, people really felt connected to me I think, because there was a real humanness about it. And so he, I just said, ‘I would really love to apply for this course, but I’m not sure, you know. I haven’t done anything like this before, in terms of how to sell myself’, ‘cos that’s what they really say, that you really have to sell yourself, and sell your business idea and actually, it’s show how it’s not a hobby, but it can be a real business, and up to that moment it was. And he just said, ‘look don’t worry. What you have said today just put that on there’. You know, and so I did. And then I got shortlisted, and I got to the interview. And because the course was several thousands of pounds, and I, it was about £6,000 or £7,000, I said, ‘oh, I don’t have that’, and they said ‘well we’ve got these kind of bursaries for £600, but we only have a limited amount and those one’s were really competitive, if I was going to pay £600, anyone who’s going to pay £600 will take them [laughs] so you know I got interviewed and they said ‘yep, we’re going to give you a place’ I was so excited and that was in the September and so I’d come back, I’d come back in April so I’d spent the whole month of March 2012 in Dallas and then I had this three day course in June and then in September that was when it started. As I said it all kind of followed each other, it just seemed it felt like destiny, it really, it felt like this was what I was supposed to do and it was meant to be and so that course changed my life [laughs]. It really did because as a craft person, you know and as artisans, oftentimes it’s all about the art, it’s all about the craft, it’s all about the creative process and oftentimes we’re not very good at the business side of things. And that’s what it gave me, it really created that balance for me and they’d say things like, you know, ‘especially in your first year, you should spend 90% marketing and 10% making’ you know, because you need to get known, and for me I was just churning out these quilts and you know, I could churn them out in my studio but who’s going to know about them, who’s going to buy them? And so they really helped me understand that balance, the balance of working on your business and working at your business. And really having that balance, and even now that kind of training that I had really underpins what I do now and really making sure I create that balance and the more that I get known, the more time I can spend making, but [laughs] but I still have to spend a lot of time. And I think for me, I have to ask myself questions. And I think for some people that’s why it doesn’t become a business for them, because that’s not what they want to do, they just want to make. And so for me I had to really think about that, cos I loved what I was doing, I loved making quilts and I thought, well actually do I just want to keep it as a hobby cos that’s what I love to do or can, some way within me resolve that actually this what I have to do to if I want to make it as a business. And actually I’d studied a business course at uni so it. I think once I’d really sat down and thought about it I thought, ‘no, I do want to make this as a business and I can’ you know I studied business at uni, you’ve got it in you!’ [laughs] ‘you can do it!’ and so I, yeah took the plunge. [laughs] And here I am! LS: Ok so your Unique Selling Point is your story, but also what do your quilts look like that you’re selling for your business? JCK: Yeah, so, that’s a very good question because I think for me as a quilter, my, I think my style is evolving. Because, you know what, I’m still learning and I think I’ll always keep on learning, and I think that’s what really important is that I don’t get stuck in one way of doing things. However it will still have my trademark if that makes sense. LS: So what is your trademark? JCK: Well I guess for me it’s about using a traditional block but making it look very contemporary. And I know for some quilters they’ve started traditional and then they’ve moved on and have done something else and gone maybe gone onto art quilts and things like that but for me it’s really important that it’s functional. So I’m very much about geometry, which is very much about traditional quilting, I’m very much about colour, and about function, about nostalgia, and very much about a homely kind of comforty feeling about my quilts and so that for me kind of like sums up what I do, there will always be a sense of history, there will always be a story in there, and even though I might do something very contemporary, which some of my stuff is starting to become, by contemporary you know there’s no patterns it’s just solid colour. But it’s inspired by an Amish block, so there will always be some kind of connection to the past, some kind of traditional aspect to my work I think. LS: So you have a website and do you sell your quilts at shows or have you done that in the past? JCK: Yeah, I’ve, ah a lot of my selling comes from my website. I do go to craft fairs and I sell a lot there as well and I do trade shows as well to really get out there and try and get my stuff known that way. So it’s a bit of a combination and I think for me I’m still, it’s only been like, I guess a year and a half or so since I graduated from that school, so I’m still testing different ways of selling. But for me oftentimes as well is that people will see my work but then will commission me to do something. So it’s interesting because people say ‘oh quilts don’t sell’ but actually I think they do, I think it’s what you are presenting to people and I’d say about 50% of my work has been sold, in terms of my collection, and 50% is commission base. LS: So, what kind of technique, do you use a rotary cutter, what is your … you’re starting a quilt from scratch. How do you go about designing, figuring out how to make it and then cutting it out etcetera? LS: You use a, you cut it with a rotary cutter? JCK: Sorry, yeah, I use a rotary cutter and a ruler. That’s how. I find for me that my accuracy is far more. I’m far more accurate when I use that and I don’t, you know once I did try just cutting and you know free-styling it a bit [laughs] it doesn’t work for me, it doesn’t work for me. And you know once in a blue moon I might not draw it first, I might just think ‘ooh, let’s just see what happens’, they’re not very successful! [laughs] [LS: You’ve learned!] And I get frustrated that I’ve wasted fabric [laughs] I’m just not that kind of quilter maybe because of how I was taught which was very much in the traditional way I suppose. So that works for me, in terms of my process. LS: And so, you machine sew and machine quilt? JCK: It depends really. I always machine piece and definitely my early work I was always machine quilting but more recently, and by recently I would say in the last six, seven months I’ve really developed a passion for hand quilting. It’s so, and it’s interesting, I remember the first time, because what I used to do, the way I was taught was in terms of the binding is to use it by machine. You know my mother-in-law said it’s really quick and easy, traditionally people didn’t finish it by hand and she taught me how to finish it by machine. And then I started experimenting with finishing it by hand and I really loved that and I think people love that quality, that there is some hand stitching in that. And then I started to evolve into hand quilting but when I started hand stitching the binding I had this flashback and it’s amazing how memories are often suppressed and something triggers it. And I remember as a child that my mum, and I’d forgotten about it, but my mum used to sew our curtains. And she used to sew them by hand and she’d always call me to thread the needle for her, and it all came back to me and you know that first time I cried and cried and cried but it was more like tears of ‘wow, this is my history’ if that makes sense and that real connection with my mum and that she, almost like she’s present, so every time I sew it feels like she’s present with me and so then I started experimenting with hand quilting and I’ve really started to get into Japanese hand quilting. Sashiko and that kind of big, because it feels very contemporary and I think it could work really well with a kind of a traditional quilt with a contemporary edge I think. And so I’ve really been enjoying that process, that motion, the kind of, almost kind of ritualised motion of hand quilting and really appreciate that. It does take more time. However doing Sashiko cos they’re quite big stitches you know, you know [laughs] I can see the end! [Laughs] I can see the light at the end of the tunnel! So I don’t do it overly ambitious and that’s one thing about me as well is that I probably wouldn’t work on a quilt that would take me a year. That’s just not me! [Laughs] I like to feel that I can see an end result and so you know it might take me a month or, actually having said that I’ve got a quilt I’ve been working on for nearly six months which I’m hand quilting! But that’s for, that’s for somebody, that’s a gift! But generally you know I’m not one of those quilters where I work on a project for a year, two years, five years, that’s just not me. LS: Where do you work? JCK: Where do I work? (LS: yeah) Well I work in my home studio. And it’s a spare room that I’ve taken over and it’s, it works for me. And I think the fact that I work from home means that I have the flexibility that I can work really early and work really late. And I can just, it’s around me. There’s something about living with it that feels so comfortable and so right for me in terms of how I work it’s, you know, it’s in the fabric of my life. And it’s. It would be very different to have to go to a studio and work. And I’d feel quite separated from it but the fact that you know sometimes I might bring some work here in the kitchen and you know you’ll find threads on the kitchen floor! 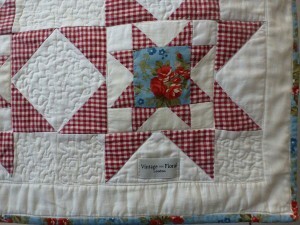 I don’t mind cos it just feels part of life and because, for me, quilts are very much about living, for me they are. They’re very functional for me and that’s what draws me to them. It feels right to have it in my home and to have it, to work with it in my home. LS: And do you have a set time for the sewing? And for the promotion or whatever that you’re doing? JCK: Yeah, that’s a very good question. Though I used to kind of like sew all during the day, then I realised that I’m well, people are not around after five! [Laughs] So because I like sewing in the morning you know. I wake up and I’m fresh and I’ve got the ideas and especially, I’m the kind of person if I’ve got an idea for a quilt I’ve got to do it, I really, I’ve got to go with it. And so I’ve learned how to discipline myself so if I do start early on in the morning then I might just do it for two or three hours and then take a break and then do social media. So generally what I try and do is try and do a lot of the business stuff in the morning and then cos I can just sew, you know, late at night, not too late ‘cos of my neighbours! [laughs] But you know I’ve got that flexibility in terms of sewing, so it’s a balance, it really is. But sometimes you know, if I’ve got a deadline then I’ve got a deadline and that’s what I do, I just sew and sew and sew until it’s done. LS: And how do you go about pricing the work? And how do you feel about selling it and separating yourself from it? JCK: Yeah, interesting. I think definitely being on that course really helped me about pricing. And that’s a big thing for me and I think is a big thing for people who sell their craft because how do you put a value on it? And again that’s been a learning curve. And for me I’ve had to be respectful to myself because I feel that oftentimes as artisans we undersell ourselves and for me, definitely my early pricing, I was underselling myself. It didn’t reflect the amount of time I was putting into it. It covered the fabric, the cost of the fabric but my time? No. And definitely being on that course, you know they were saying ‘Jennifer you need to double your prices’. I’m like ‘oh!’ [LS laughs] That was a real shock for me. It took a while for that to sink in, it really did. I really, really struggled with that. They said ‘Jennifer, you’re too cheap’ and especially, and you’re talking about what is my USP, what is my Unique Selling Point, I only make limited editions. So I only ever make nine. And the reason why it’s nine is linked to my parents, because my dad died on the ninth month of the year and my mum died on the ninth day of the month that she died. So that’s why it’s nine. And they said ‘well Jennifer, it’s limited, even more so it’s valuable, it’s not ubiquitous, it’s not going to be everywhere, you really need to price it accordingly. And the fact that it’s your time, are you really pricing your time?’ You know I was pricing initially at £5 an hour, then £10 an hour and they said ‘well Jennifer, that’s not that much above the minimum wage! This is, you know, this is a craft, an expertise that you’ve developed, you really need to price it accordingly.’ And so that has been a struggle and I think I’ve resolved it where, you know, I do price it at a decent price, based on an hourly rate for my time. LS: So you keep track? JCK: I do. I do, and actually that’s one of the most important things that they were saying on the course is that you know as craftspeople we could have an idea ‘oh, it took me this’ and actually when you really do keep track of time you’d be so surprised how much longer it takes. And I think we always underestimate that so I do, I have a clock in my sewing room and if it’s a new project I will keep track of how long it takes me. And if it’s a project that, I kind of like know now it takes me about 30 minutes, between 20 and 30 minutes to do a block depending on complexity but. So for some quilts I know roughly. Okay so I’ve noticed that it takes me this x amount of time and then I can just work it out but I always have a clock in my sewing room. And so I price it by the amount of time it takes me. I also price it by the cost of the fabric. But also as well the cost of the fabric to a place. So some fabrics I’ve bought on sale and then it goes up so I price it on the full retail price because if I was to replace it, that’s how much it would cost me. Also as well, some fabrics I bought while I was in the States. If I was to buy it whilst I was over here I’d have to pay for the shipping so I factor those kind of things in because that makes sense, if I’m, if I produce something I keep my originals, generally. I’ve recently started to sell them which has been sad but I just don’t have any room any more in my studio. But generally I keep the original. So if I do make something for somebody else it’s hand-made to order. So I have to think about if I need to get this fabric again how much is it going to cost me to get it again? So I price, I factor that in. And I also factor in a profit and for me that profit is about the cost of maintaining my sewing machine, it factors in the cost of the threads, it factors in the cost of insurance I need for my business, it factors any costs that I need in terms of marketing my business, who pays for my website, who pays for, you know all those kind of practical things. So it factors in those and it’s a percentage of all those costs that I feed into each quilt. Otherwise if I only just cover my time and I only cover my materials there’s no money for development as a business which is really important. So that’s how I do my pricing. LS: And because it is a hand craft, you put yourself into it, do you feel a sort of separation problem when you’re handing it over to the buyer? Or are you just happy to sell your product? JCK: I think for me it’s an honour to make a quilt for someone. And I know what it feels like to have someone make a quilt for me. And before my mother-in-law taught me how to make a quilt she made one for me and my husband. And she flew all the way from Dallas, Texas to deliver it to me and there’s nothing that beats that feeling that somebody has spent their time, their effort, their energy, their money, to create something so beautiful. And it was so moving. I almost cried when she did that. And then I, you know, she agreed to make a second one for me because I wanted one for my guest room. And this time she was sending me fabrics in the post from the States which was lovely. And then she made it for me. And then a second time she flew from Dallas and delivered it to me personally. Now to me that, there’s nothing that compares to that level of love and respect that she had for me to do that. And so when I make a quilt I think about that, that I’m making a gift for somebody that will last many lifetimes and will have its own history, and hopefully be passed down and so for me it’s an honour that I am making something that somebody, that become absorbed into somebody else’s life. And that’s how I see it. And I think it’s because traditionally quilts were made like that, you know, the community would come together and they’d make a quilt for the bride and the groom, and it’s that sense of community, of people coming together in an act of love to make something for someone. And for me that’s what I get when I make a quilt and I give it. I get so excited when it’s finished! [Laughs] And I’m so keen to hear what people think and around receiving it and you know, you know it’s wonderful when people do come back to me and say ‘wow, it’s like something I would never imagined it would turn out to be!’ And for me that is where I get my satisfaction so I don’t have a problem in parting with it. I have more of an emotional connection if it’s the original and I think it’s because I generally tend to keep my originals. So if I was. I wouldn’t want to give this away. So I’ve made many versions of this for people that have seen it and bought it, but I always have the original. And there are some originals that have been quite experimental and I haven’t had that same emotional connection, but the ones, where the emotional connection is for me, is the original ones that I’ve made and really loved making and have a real kind of attachment to. LS: Okay, a slightly different tack. Do you go to quilt shows to look at quilts, and if so, what kind of quilts are you drawn to? Is it just traditional or are you attracted to Art Quilts as well? JCK: When I do go to quilt shows I must admit I do hunt down the traditional art first, I really do. Because I’m curious to see what are they going to do? Are they? I think sometimes people think, ah traditional quilts, seen that. You know, been there, done that. Seen it all. For me there’s a real curiosity, how are they going to interpret those traditional blocks? Are they going to go down a very traditional route? Whether they do a contemporary spin on it. Are they more affiliated with what I would do with it? So I, that’s the kind of fascination for me. I love it, take loads of pictures and get really inspired by that. And then I do go off to the contemporary section. And the reason why as well is because, I’m thinking of Gee’s Bend quilts which are traditional and contemporary and, you know, either lots of log cabin, how they do a spin on that and make it look so contemporary. So I love their work, I really do. Which has a very Art Quilt feel to it so I can really appreciate that. And even work that I wouldn’t necessarily buy or wouldn’t necessarily make I still have an appreciation of it because it is a quilt and I understand the process of quiltmaking even though an Art Quilt might be very different in the processes, there are certain processes that do overlap and I have a real respect for that. And a real respect that someone has had the time to think about that in terms of their creativity, and how that creativity translates into a quilt. And my emotional connection to it, so I guess like a work of art, in terms of viewing that. So I do enjoy that exploration but definitely I’d always say traditional quilts is my first stop off [laughs]. LS: Okay, so what is your definition of, what makes the perfect quilt? Is it the design, the way it’s stitched, the colours, what is it? JCK: Do you know that is a really hard question to answer. Because it depends what kind of quilt. So if it’s an Art Quilt for me there really has to be some kind of emotional connection. Having said that, even a traditional quilt for me has to move me in some way. So I guess that’s maybe the common theme then. That the ideal quilt for me is a quilt that gives, creates some kind of emotional response for me. And I was about to say you know something that has a fresh interpretation but I’ve seen quilts that haven’t had a fresh interpretation but the execution is amazing! It’s so, it’s perfect! [Laughs] What else can I say? Although the actual quilter would probably say she saw the flaws but there is a respect for the skill and the execution of the work and I remember seeing a quilt which was a whole-cloth quilt, nothing necessarily new about it, I think actually, and I was quite surprised but it did win second prize. And I think probably the reason why maybe it didn’t win first prize it was because it wasn’t original. But for me the execution was stunning and it stunned me! It was wonderful! And I think for me again it created an emotional response and I just really appreciated the effort and skill. Having said that if someone’s doing something quite unusual and different. However I don’t just go for something that’s just unusual and different for that reason if that makes sense. Just because it’s something a bit quirky and a bit different doesn’t necessarily draw me in. So I think where the quilter has really thought about how they are placing the fabric on that quilt and whether it’s a block or you know a whole cloth, whatever, how they’re thinking about that and the quilting. As we know the quilting is what ‘pops’ and what brings it to life and I think for me… [pause] I’m just thinking. It’s not only the execution but… [pause]. I think detail. I think where I see a lot of detail in a quilt that really moves me because I really appreciate the amount of effort that’s gone into it. LS: Detail in piecing or embellishment or…? JCK: I think both. Because I see some Art Quilts and there’s embellishment and there’s lots of detail in that. Having said that on the flip side something that’s just so simple can just be so effective because it’s not too busy on the eye. And so the eye can rest and really take in and so I guess for me there really is no perfect quilt because I’ve done, you know, different extremes. Polar opposites. And so I don’t think there is for me that kind of definition and I think maybe that’s why quilts are so beautiful because they can be so different and yet still be so magical. LS: Okay. 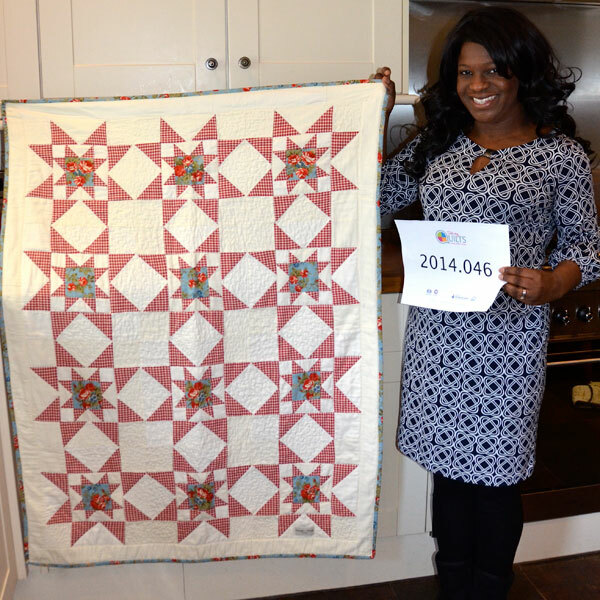 So what’s the biggest challenge that you face as a quilter today? JCK: Mmm. Biggest challenge. I think time is definitely the biggest challenge for me because, especially running it as a business. Because if it was a hobby then you know I can make the time and just do whatever I want. And there’s a frustration there because I can’t always do whatever I want. And I think for me that there’s several reasons why I quilt. I quilt for my sanity [laughs]. You know I quilt to have that sense of peace. I quilt to develop my skills. You know I quilt to experiment. So many different reasons why I quilt. I quilt to have a real connection with the past and so many different reasons why I quilt. And oftentimes all of those reasons are not fulfilled because I might have a deadline and therefore I, the experimental time has to be put on the back burner. I’ve got a deadline, I have to get it done. I have to do it. And so definitely time is the biggest challenge for me as a quilter. LS: Well you’ve also answered my last question which is why is quiltmaking important in your life? Which you’ve just said it [JCK: Yes] Are there any other reasons why? What’s the biggest, greatest importance of quilting in your life? JCK: I don’t think there is one, I think it is a combination of the fact that, you know, I go into my space. It’s my space, my zone and I just, I have an expression of creativity that I can share with others. I think it’s. And that sense of accomplishment, there really is for me that sense of accomplishment when I’ve finished a quilt. And then I always, the first person that gets to see it is my husband ‘what do you think?’ [Both laugh] He’s my critique and he’s the ball that I bounce off and sometimes, most of the time I’m quite clear about what I want to do but occasionally I think ‘mmm, is this gonna work?’ especially when I step out of my comfort zone and then you know I’ll bounce ideas off him ‘oh, what do you think?’ and he’ll think ‘I’m not sure if that works’ and sometimes I listen to him and sometimes I don’t. And the times that I don’t I think ‘I think he can’t see what I can see’ and then I keep going and then when I’ve finished like ‘wow, oh my gosh I was so wrong!’ [Laughs] And then sometimes I think ‘yeah I think you’re right actually. I don’t think this is going to work.’ So, for me, it’s that expression of creativity, it’s that, I said very much about the history that definitely was my journey into quilting, and that kind of… And what it satisfies in me and the discovery and curiosity. Quilts make me curious. And so it feeds that in me. It also feeds perfectionism which I’m not sure is a good thing [both laugh]. Especially traditional quilting. There is that sense of perfectionism where it has to be just right and I think for me as well it is balancing that and putting it into context because sometimes it can get [laughs] you know it can just be a little bit too much! You know. And I actually made my mother-in-law did tell me about this story about this, oh I can’t remember, this kind of mythical person who gets very jealous when your quilts are perfect so you have to have at least one mistake in them. So that kind of eases my conscious a little bit about it but it’s very satisfying thinking of an idea and then sketching it out and then choosing the fabrics and then making the top and then quilting it and then it’s done, think ‘wow!’ It’s the journey. I really enjoy that journey and the process of it and I guess that’s what it is for me. LS: Wonderful. Well I’ve really enjoyed your journey, telling me about your life in quilting. Is there anything that you, that we, haven’t covered that you’d like to mention? I think we’ve probably done it all. JCK: Yeah. I think so to. LS: Thank you very much Jennifer.